The scene is set for dreaming. Like dewdrops caught in a silken net, thousands of crystal droplets shimmer in the slightest breeze above a secluded parterre in Dumbarton Oaks. For the last year, this unexpected confection of light and space has enchanted visitors to the historic garden at the north end of Georgetown. The work of the Cao-Perrot Studio of Los Angeles and Paris, the “Cloud Terrace” was supposed to have been dismantled last November, but it has proven to be so popular that the garden directors decided to leave it up all winter. It’s now expected to be gone at the end of March. We’ll see. In the meantime, the quiet shimmering beauty of the work continues to draw crowds who attempt to capture its mysterious allure with cameras great and small. Cameras click like castanets, trying to catch pixie dust. I was lucky the first time I went to see it. Perhaps because it was a weekday, and a rare sunny day between windy storms, there were few people there. 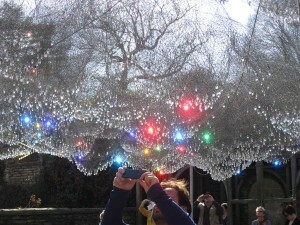 I could sit and savor the way the hand-tied Swarovski crystals catch and throw the light. 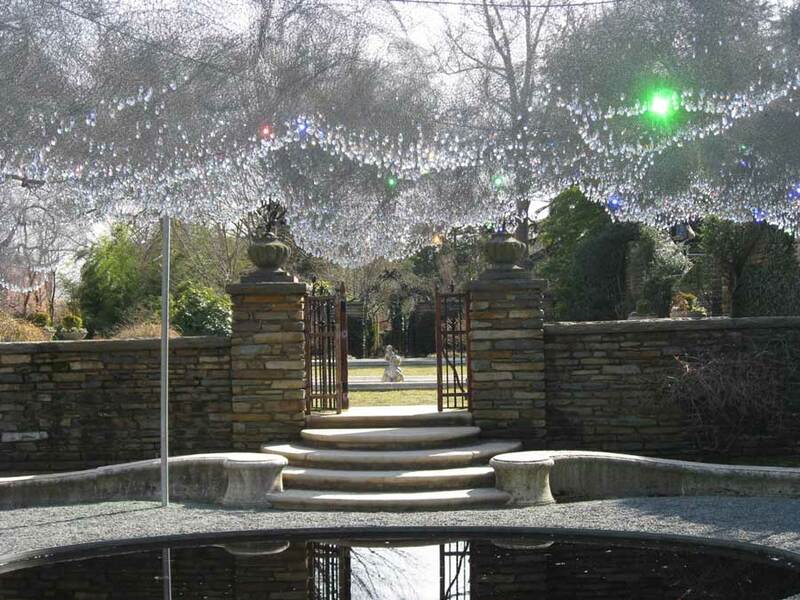 Such a distinctive temporary art installation seems all the more striking in Beatrix Farrand’s classical garden setting, where little has changed in decades. Even the most meticulously designed garden is subject to the relentless tide of time. Blooms come and go. Trees age and die. The entire composition of a garden is in a continual state of flux. You could say that every garden is a temporary work of art. Many gardens vanish when the gardeners who created them pass on. Luckily, when the great gardens of the past are championed and sustained by successive generations of garden lovers, our lives continue to be enriched by these dynamic works of living art. I don’t know what Beatrix Farrand would have thought of the “Cloud Terrace,” but it’s clear as crystal that modern crowds can’t get enough of it.